It hasn’t exactly been easy to this point, but hopefully by day four the aches and pains are beginning to subside and you’ve found your walking legs, because you’re going to need them for today. Only a couple of other days along the Pennine Way have a higher height gain than this section. This stretch starts with one of the hardest ascents of the whole walk, a lung-bursting 1000ft (304m) climb in the first two miles (3.2km) as the Way ascends through Mytholm (Map 22) passing Badger Fields Farm (see opposite). The effort is compensated for by the varied scenery of lanes, steps, passages and fields; you eventually reach Colden (Map 23, see p124) and then Mount Pleasant Farm, the last house before the open expanse of Heptonstall Moor (Map 24), where you will find the first wild camping opportunity since leaving Hebden Bridge or, if you prefer a campsite, the path to Pennine Camp & Caravan Site (see opposite). The moor is crossed on a good path which then drops down to the lush, green beauty spot at Graining Water (Map 25). Make the most of it, because the next few miles are either along reservoir access roads or on the harsh gravel paths beside them. You’ll pass two of the three Walshaw Dean reservoirs (Maps 25 & 26) before, thankfully, turning your backs on them and climbing the moorland path up Withins Height (Map 27) to the old farmhouse of Top Withins that many associate with Emily Brontë’s Wuthering Heights. In the summer this place is bristling with tourists. From here many choose to divert from the Pennine Way to visit Haworth (3 miles, 5.5km, 1?hrs), for the full immersive Brontë experience (Maps 27 & 28). An overnight stay here will break up this long section and allow an afternoon of sightseeing and indulgence in this wonderful village. You can follow the scenic Brontë Way, from Top Withins, past the waterfalls, down to your accommodation. If you ignore this literary diversion and proceed along the Pennine Way, the path drops down across moorland to Ponden and a rather contrived path around the reservoir of the same name. Another long ascent lies beyond, only 800ft (244m) this time though and you are rewarded with the crossing of the heather-clad Ickornshaw Moor (Map 30), past the wooden huts (called cowlings) and down, across fields into the tiny village of Ickornshaw (Map 31). However, many people make the short diversion into Cowling with its slightly wider choice of accommodation. Trying to find the Pennine Way path among the myriad of other green footpaths leaving Hebden Bridge is a bit like trying to find a needle in a haystack! The route through the maze is well signed though and you’ll be walking slowly up the steep slope so will have little trouble spotting them. The crossing of Heptonstall Moor is aided by slabs and a well-trodden path and provided you don’t miss the sharp right turn at GPS 030 that takes you down to Gorple Cottages, this potentially tricky section should be a breeze. Similarly, the path from Walshaw Dean Middle Reservoir across the moor may look desolate on the map, but the slabs are here too and the signposts which prevent the day-trippers from straying from the path serve just as well. 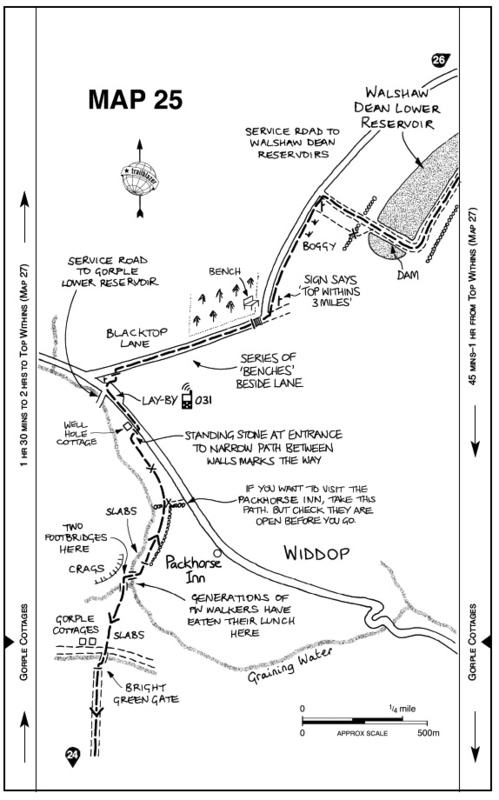 Leaving Ickornshaw Moor is more likely to cause confusion than the crossing of it, so keep an eye out for the left turn at GPS 045, down through the fields to the waterfall at Lumb Head (Map 31). There is a new path around Lower Summerhouse Farm, but it is well signed and exits into the field beyond at almost the same point.